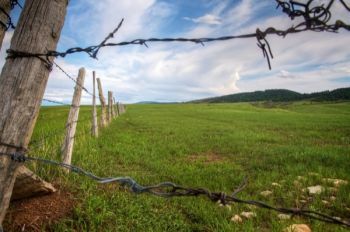 A fence line accentuates the green prairies that border the Hogback near St. Onge. Click to enlarge pictures. 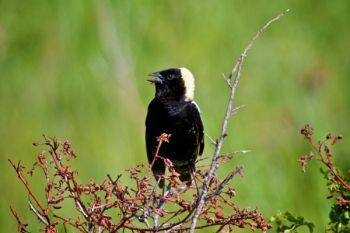 A Bobolink singing in the sun. Shooting Star flowers in the dappled light of late afternoon along a trail on the Hogback. 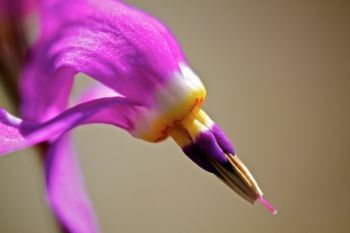 Close-up of a shooting star flower. Tall grass makes the Sidney, Neb. to Deadwood stagecoach trail hard to see, but the ruts are still there — a testament to an earlier and colorful time in the area. An old cavalry jump found at the Fort Meade Recreation Area. Old Fort Meade Cemetery with a view of the fort itself and Bear Butte through the break in the trees. 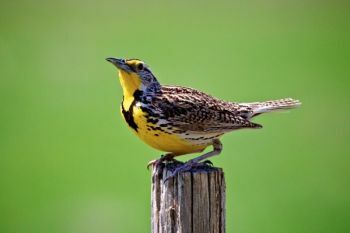 A happy meadowlark on a fencepost that borders the northern portion of the recreation area. 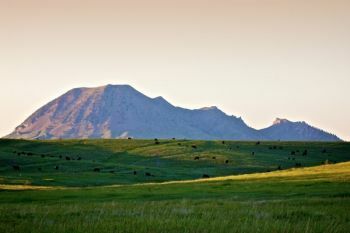 Bear Butte in the evening. 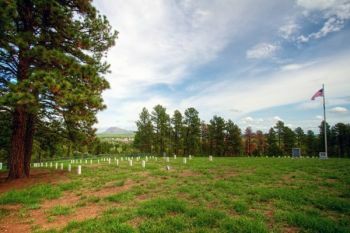 The recreation area offers many great views of the butte and the prairies that surround it. 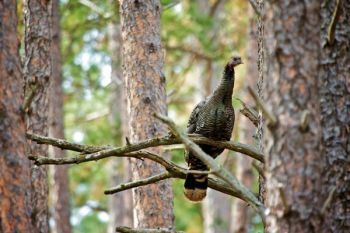 A roosting wild turkey hen along a trail on the Hogback. 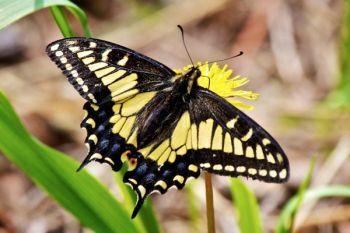 An Eastern Swallowtail butterfly dining on a dandelion on the top of the Hogback. 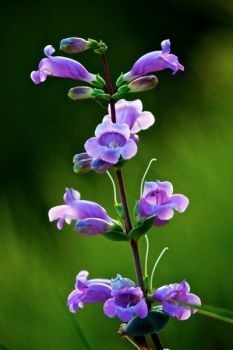 Blue beardtongue flowers in bloom. 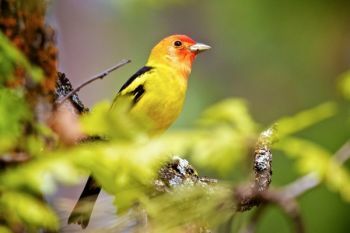 A colorful Western Tanager flew up close to me while hiking. I’m assuming he just wanted his portrait taken. I obliged. A view of the Hogback with the Black Hills proper in the background. Sandy the three-legged dog was a great campground host. Sunset looking west towards the Hogback from Bear Butte Lake. 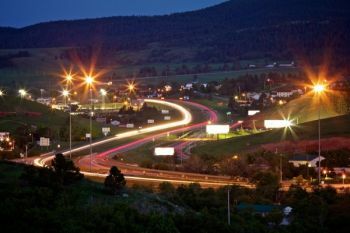 A modern-day view of the racetrack as traffic from I-90 races along the outskirts of Sturgis. Earlier this spring I rode with retired Bureau of Land Management Biologist Chuck Berdan to view and photograph Greater Sage Grouse mating displays. Along the way we started talking about interesting places in South Dakota for a photographer to visit. He told me that I needed to visit the Hogback and Racetrack surrounding the Black Hills in the springtime. 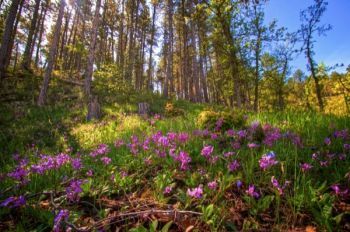 This bio-diverse area, located where the plains meet the mountains, is full of wildflowers and wildlife — just what the doctor ordered for an outdoor photographer like me. The problem was that I had not heard about these landforms before. After further explanation by Chuck and some research in a few books about geology, I learned that I have indeed spent a lot of time on the Racetrack and crossed the Hogback numerous times without even realizing it. When I was a kid, my family lived in Ziebach County. Whenever we drove down to Sturgis to visit my aunt and uncle, I distinctly remember coming into town on Highway 34 and going through steep cliffs just after passing Fort Meade. The hills and ridges that formed those first cliffs is the Hogback. I also remember that the rest of Sturgis was nestled in a somewhat wide valley with red dirt before the hills of the Black Hills really got going. This red valley is the Racetrack. Chuck told me the Fort Meade Recreation Area was a great place to explore the Hogback. 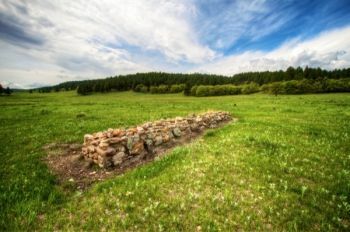 There are basically two areas to explore: the ridge portion south of Sturgis that borders Alkali Creek and the prairie portion to the north of town that goes right up to Bear Butte State Park. This area is steeped in history as well as culture. 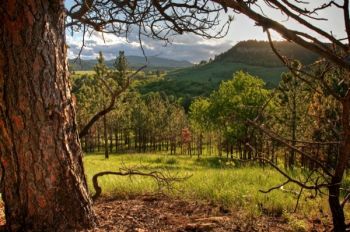 As you hike the trails, it is easy to picture yourself in the days of the Old West. There are stagecoach tracks visible and cavalry jumps still in place. There is even the grave of Curly Grimes, an outlaw buried where he was shot — on the shoulders of the Hogback just west of the campground. If you take a larger step back into history and culture of the Native Americans, the place has an even more interesting story to tell. 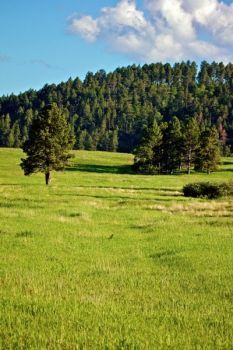 According to Lakota legend, the red valley Racetrack surrounding the Black Hills was created with the blood of animals in a great race. The buffalo won the race and was determined the supreme animal on the plains and sacred to the Lakota. As for me and my camera, Chuck was absolutely right. 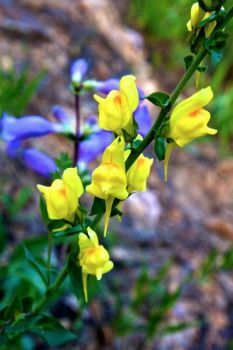 The place is full of wildflowers and colorful birds and butterflies. 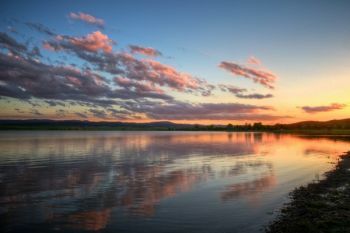 I was surprised that a recreation area so close to a well-known South Dakota town was so unknown. The campsite on Alkali Creek was not even half full on the Saturday that I was there. I did, however, get to meet Sandy, the campground hosts’ three-legged dog. 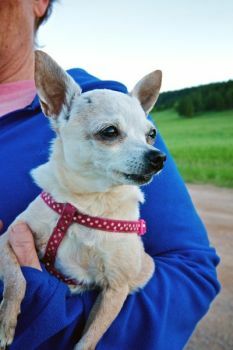 She had lost her 4th leg to a copperhead snakebite in Texas, but this injury didn’t faze her at all as she hiked happily with her owners. My guess is after an ordeal with a copperhead, an occasional encounter with the prairie rattlers that inhabit the Hogback and Racetrack probably wouldn’t scare her a bit … which is more than I can say for myself. Regardless, I plan on going back to the area in the fall to see what it looks like when the leaves of the trees turn. The time between seasons is always beautiful. Fittingly, I’m sure it will be even more so in this place between the prairies and the mountains.